One of our main principles is never begin to fight if there is another opportunity to act. Only a real threat, a rival's attack gives us the reasons and moral right to apply our martial knowledge and skills of our System. Finally, we’ve conducted it... It was more than three years ago, when the readers of our site first asked us to share the secrets of mind preparation for extreme conditions by means of our personal safety technique system. how to be able to defend yourself even when you are exhausted. All this was done thanks to the special techniques and exercises of our personal safety technique system from the first year program. Individual and group training on the first year training program. Practical survival skills in extreme conditions, which work everywhere - in all circumstances, in any situation, with one or several rivals. Some weeks ago we held a seminar where a very important topic was brought up – psychological training for the combat actions, which we use in our system of personal safety technique and special training programs for the members of some units. It deals not only with fear and the ability to control it in an extreme situation. It also deals with psychological states and military state. ... that require not only learning and understanding, but also development of special skills in order to make some mechanisms of our organism work effectively in an extreme situation. We'll be fair with you-this topic is not for everyone. But if you find some time for one’s self-development in this area, the results will exceed your expectations. There are a lot of people, who promise you too much. They say that their training classes, methodology and knowledge are the best. If we give you such promises, soon you won’t take us seriously. We don’t want this to happen. We just want to make you a simple proposal: let us explain what we want to say. Let us teach you the main elements and principles of psychological training in an extreme situation. You can compare this to what you’ve been doing earlier, or to what you’ve never done before, but have seen or heard about. In order to understand how effectively this program is, and how you can boost your self-confidence with its help, you should try it. The main reason we want you to get acquainted with this program, is to help you acquire a real experience, and not just a pile of promises. In fact, we’d like to put in your minds and hands the basis, thanks to which you will be able to go along a street and feel confidence, that if somebody is hostile or aggressive towards you, you will know what to do. We’ll teach you how not to be lost in an extreme situation (where fear can arise); how to defend yourself when you are exhausted. We are not exaggerating and this is not a marketing ploy. The efficiency of the system is a thoroughly documented fact. We have received hundreds of references from different organizations, government units and ordinary people, which confirm the efficiency of the system in various conditions and situations (including battle zones and emergency situations). Both, the general principles and the specific methods of our system are based on the strict scientific data (each of them can be explained from the point of view of mathematics). And what is more important, all of them have been tested in practice by hundreds of people during a long period of time in various situations and conditions. The system really works. It has stood the test of time. One of the ways is to spend years trying to do something and learning from one’s mistakes. There is another way-go with us through a three-day seminar (to do this you won’t even have to leave your house). We’ll teach you what you should know, learn and do. Our task within a seminar is to teach you how to think and act in an extreme situation, using the strategy and system. We want to change the way you are thinking. We want you to use any situation, opportunity, problem or condition to your advantage. We want your weaknesses to become your strong suit. Moreover, we’ll share with you the thing that is the most important, according to the minds of our trainees - how we see the system of personal safety technique and hand-to-hand fighting. To be able to aim one’s efforts at the usage of your rival’s strength and aggression against himself. For this purpose you should use just 25% of one’s strength. You should put a priority on these two rules in your work. When you realize our ideology completely, you’ll have no doubts concerning the way you should behave yourself and opportunities that you should use. You’ll know how to use your every resource effectively. When you know for sure that in any situation there will appear new opportunities, which you can use at 100%, you’ll feel yourself strong, free, safe and stable. You will get knowledge and skills that will help you not to be lost in an extreme situation; not to let fear paralyze your body and brain due to a large discharge of hormones. Thanks to the special methodology and exercises of our personal safety technique system you will be able to protect yourself even if you are exhausted. You’ll get the skills and hand-on experience of survival in an extreme situation, which work everywhere. They work in any conditions or situations; with one or several rivals. 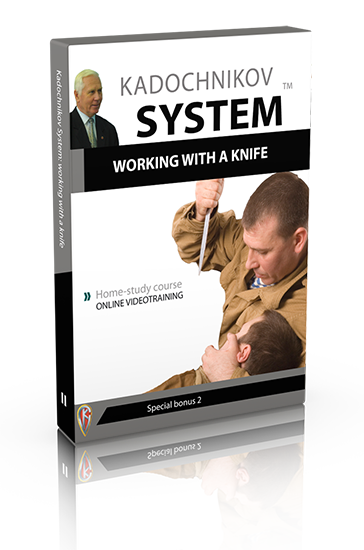 You’ll increase your personal safety potential, as you’ll learn the best and the most efficient ways of the psychophysical training. They are elegantly intuitive, simple and easy to understand. You’ll boost your self-esteem and confidence, as you’ll be able to use these skills and knowledge at any moment, where it will be necessary. You’ll be able to win against any person, who will be aggressive towards you. It will make no difference whether he is stronger or faster than you are; or whether he attacks you from the back, from the front or sideways. Every time somebody threatens you, you’ll feel self-confidence. On the subconscious level it often frightens people away. So, they won’t even continue their actions towards you. Every time when somebody will try to get you into a conflict, you’ll be able to stop them by making some simple, but effective movements. These movements aren’t very hurtful, but they are painful enough to bring a person down to his level. If the initiator of the conflict doesn’t understand what you are saying, you’ll always have at hand some convincing arguments. You’ll improve your self-discipline, focus, clarity of mind and consciousness. There will be no place for fear, negative emotions and anxieties in your life. You’ll boost your self-confidence, recover peace of mind and earn a great reputation. All this will help you to be confident that nobody will do any harm to you or your family. But even if somebody will try to do this you’ll possess enough knowledge and skills to protect yourself and your family. You’ll come out victorious out of any unpleasant situation, as you’ll know the basis. You’ll be able to control your opponent and disadvantage him. We are so sorry that you couldn’t come to this seminar. It was worth it. as we are not planning to hold such kind of a seminar in the nearest future. The duration of the seminar is 12hours. These hours cover the most important and essential information, which has already helped hundreds of people, like you, to come out of any extreme situation with dignity by following the instructions. In fact, the basic skills of personal safety technique are much easier than you might think. Our system differs radically from all existing; it is simple and easy to learn. But if you come with a heavy load of stereotypes, the lion's share of time you will need to give it up. ... which can train you in the universal combat skills, even if you don’t remember the last time you’ve trained (sports training is not necessary), the proposed video training is exactly what you need. This training will help you to develop the skills, which will help you to survive in any extreme situation, within a short period of time. However all serious authorities, professionally involved in the preparation of people to survive in extreme circumstances, take into account in their work the results of scientific studies,..
which have conclusively proven the reaction of one’s organism to this or that kind of a stressful situation. The simplest and at the same time the most reliable indicator of these states is one’s pulse. An average healthy person has heart rate at rest of 60-80 beats / min. If your pulse is in this range - it means your nervous system is working properly. Professional fighters and martial athletes have heart rate during competition of 115-145 beats per minute. A trained athlete's body can cope with stressful loads of competitive activity quiet successfully. The sport rules, the presence of the referee and judges, atmosphere in the gym, - all these factors make it clear for the athlete on the subconscious level that his life is not threatened. Such training increases although the adaptive capacity of a fighter to operate in extreme conditions, when one’s health and lives are in danger; but this training doesn’t solve the problem completely (that is why the army and police in many countries are encouraged by various combat trainings). And we’ll say why. A release of additional hormones will be as a result, which is our nervous system can’t cope with, without serious consequences. One’s peripheral vision doesn’t operate, the function of hearing is declined, and even a trained body of an athlete will be paralyzed for a few seconds (at best). In this state, the pulse rate is 175 beats per minute and above ... But even a few seconds is enough to loose one’s control and get injured. We think you already know that any system of human survival is designed to prepare a human to such extreme situations, when the pulse of untrained people goes beyond 175 beats per minute or higher. Here comes into play the personal safety technique. Having mastered the basis of personal safety technique according to our system, you will learn how to use the power and aggression of your enemy against him ... you’ll become a hunter, not a victim. The training will teach you how to use the most optimal algorithms for your actions in accordance with the basic principles of our system; as well as to master the basic skills in practice. The system which you’ll master through the proposed training will work under all conditions and circumstances, with one or more opponents. This is because our System is based on scientifically grounded and proven principles, which can be described even mathematically. These are extremely effective knowledge. It's hard to believe, but this knowledge is tested in practice by hundreds of people over a long period of time. Work on the development of our system of personal safety technique started in 1961. We think that this work has benefited both the state and a lot of ordinary people. How Can You Improve Your Skills and Personal Safety? What determines the deadly accuracy of one’s movements. Form the algorithms of close fighting, taking into account the huge shortage of time to take the right decision; against the background of general fatigue or dilapidation of the body, in stress and many other unfavorable factors. Of course, you know - your skills increase your social value and self-esteem, lack of knowledge brings problems. Definition of ignorance: "Lack of skills, abilities or knowledge." constantly seek for more knowledge and improve their skills. We think that if you're still reading this presentation, you are quite serious about the personal safety technique. The program of the video training is the result of years of long work in this area. If this knowledge will be useful for you at least once in your life, it will cover itself many times. A video version of the training “Kadochnikov System Psychological Training” is the only possibility to get acquainted with the system of complex psychophysical training in the most convenient and comprehensible form, as we are not planning to hold such kind of a seminar in the nearest future. The duration of the seminar is 12 hours. These hours cover the most important and essential information, which has already helped hundreds of people, like you, to come out of any extreme situation with dignity by following the instructions. We aew so sorry that you couldn’t come to this seminar. It was worth it. But there are some advantages to it… You don’t have to go somewhere or pay for a hotel… You’ll be able to work with this material as long as you need it, without missing any important information… Which, unfortunately, sometimes happens during a seminar. …You’ll get more than 12 hours of the full video version of the seminar (we have recorded on video every explanation, display and even the questions of the trainees and put it into the special digital member`s area, where you can watch the training online or download it on your device). You’ll get access to all the knowledge that we shared with the participants of this seminar during those three days. You’ll have a chance to revise the most complicated and missed information. It’s well known that during a seminar it’s possible to take in only 5% of the received information. The rest of the information will go to your subconscious mind. …by investing 397 97 USD in your self-development and safety. The price of the course already includes lifetime access to digital member`s area where we will post training upgrades and client-only bonuses. The knowledge that we’ll share with you during this training is the result of many years of work in the area of survivability of a person in extreme situations. If this knowledge will be to your advantage just once in your life, it’ll be worth it. ...If you act now you will receive two exclusive bonuses! 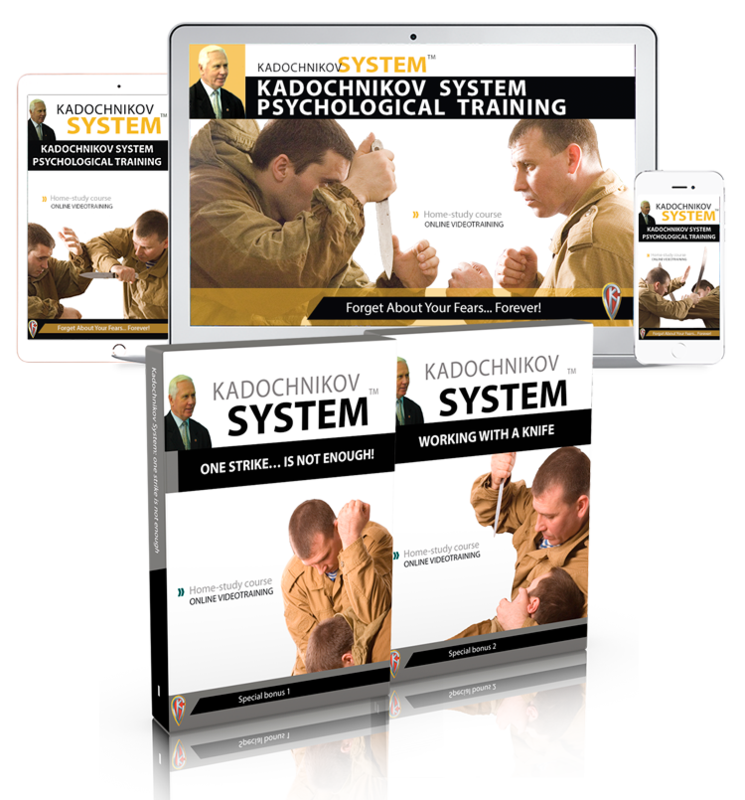 Kadochnikov Systema Special Course: One strike... is not enough! Special Course: One Strike… Is Not Enough! If you don’t get the necessary result from mastering the System within two months, then we will refund your money. Without a question. 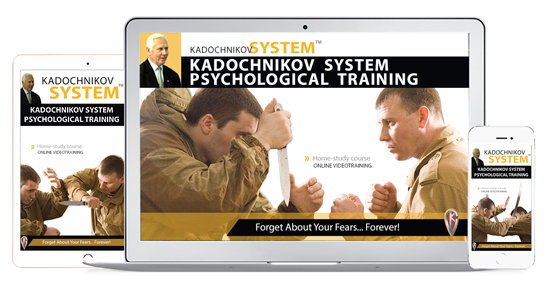 Videotraining "Kadochnikov System Psychological Training"
YES! I would like to get rid of fear and the feel of uncertainty forever with your system of effective self-defense. I will receive a digital (delivered via Internet) homestudy video training which consists of 8 instructional modules (more than 12 hours of video) which I will be able to immediately download to my device (PC Mac Ipad Iphone Ipod etc.) from your website and watch online. I don`t risk anything because I have your 100% guarantee. P.S. People always say "Find a Teacher" ... But it’s easier to say than to do! The fastest way to learn something is to find a teacher. But if you're looking for a true, experienced mentor, you’ll be in difficulty. That's why we offer you the opportunity to get this video training. P.P.S. To feel internal uncertainty concerning one’s ability to defense oneself and one’s family when necessary, is an awful life scenario for a person with dignity and self-respect. We hope that the program on psychological training for combat action will help you to feel self-confidence; to be sure that if somebody is hostile or aggressive towards you, you’ll be able to withstand them; to win against any rival and neutralize any conflict situation.